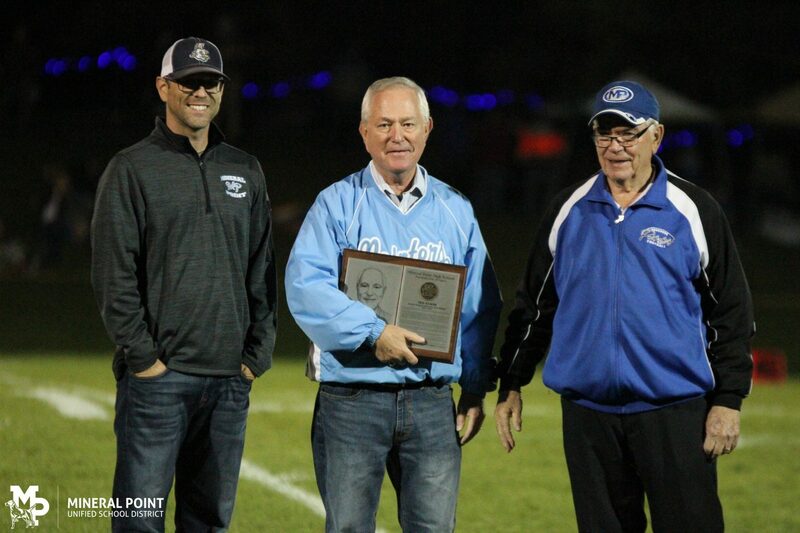 Ted Evans was inducted into the Mineral Point High School Gridiron Hall of Fame during halftime of the Homecoming game vs. Fennimore October 5, 2018. Ted graduated from Dodgeville High School in 1967. His senior year he was named MVP in baseball. He graduated from UW-Platteville in 1972 earning a Bachelor’s Degree in education. While at UW-Platteville, he lettered for four years playing baseball. He received his Master’s Degree in 1992 from UW-Madison. Ted was hired in 1972 by the Mineral Point School District and served the district, community, and students for 39 years. He began his teaching career as a history teacher, followed by assistant principal, and concluded the last 15 years as the high school/middle school principal. During his teaching career, Ted was the varsity head baseball coach for 24 years–the 1974 team made the school’s first state appearance winning the quarterfinal game in a one division tournament. In 1987 he was selected to coach the South Team in the Wisconsin High School Baseball Coaches Association All-Star game at Milwaukee County Stadium. The South Team finished 3 – 0. Ted served as Treasurer and Executive Secretary for the WHSBCA for 20 years. He was inducted into the Wisconsin High School Baseball Coaches Association Hall of Fame on February 14, 1998. Ted was an assistant softball coach for the team that made the school’s first ever state tournament appearance in 1983; he also assisted in wrestling at the middle school level for Coach Al Bauman, and was assistant basketball coach with Coach Gerry Douglas. Both Coaches, Bauman and Douglas, were long time football assistant coaches. Ted began with the Mineral Point High School football program in 1972 as the scout for Coach Ron Murphy’s football program. Later he served as a freshman football coach for three years, and became the offensive coordinator in 1987 through 1994. Coach Murphy allowed a change in the offense that brought a “pass happy” playbook to the program in ’87. Mineral Point made the WIAA football playoffs in 1987 for the first time in school history, defeating De Soto in the first round. The Pointers also made the playoffs in 1989, 1990, 1991, 1993, and 1994. Conference was the two division SWAL and conference records were 4 – 2 or better in seven of those years, with a conference championship in 1991. Ted coached numerous outstanding student/athletes, but particularly the quarterbacks and wide receivers. The quarterbacks included Mike Murphy, Mike James, Matt Lindsey, and Andy Palzkill. Each of these players set and held various school and state records for passing. Mike James, Matt Lindsey, and Andy Palzkill went on to play college football. Palzkill and James returned to their alma mater to coach–Mike as the offensive coordinator and Andy as current head coach. Ted is an active committee member for the Football Stadium Project. In this role, he has helped to bring in revenue to move the football stadium to the high school. The field was officially opened for varsity play on Friday, August 28, 2018, beating Dodgeville 24 – 8. Ted has been the Conference Commissioner for the Southwest Wisconsin Activities League since 1992 and currently continues in that role. He also served on the WIAA Board of Control from 2009 – 2011. Ted is married to Patty. His children and grandchildren are Kendall (Jen) Evans with grandchildren Samantha and Mason, Kyle (Keri) Evans with grandchildren Madalyn and Tanner, step-daughters Trina (Terry) Slack with grandchildren Chase and Brooks, and Tricia (Mike) McVay with grandchildren Makayla, Dominik, and Chloe. During his years of coaching, he was very fortunate to have coached both Kendall and Kyle in football and baseball. Ted is very grateful to have had the opportunity to live, teach, and coach in Mineral Point. The community tremendously supports its academics and athletics.